If you're looking for Whole30 compliant jerky, we've found nine options that are made in the USA. Even if you're simply looking for dairy free gluten free, soy free, and sugar-free options, these are great choices from which to select. All options listed below are dairy free, gluten free, MSG free, nitrate free, soy free, and sugar free. 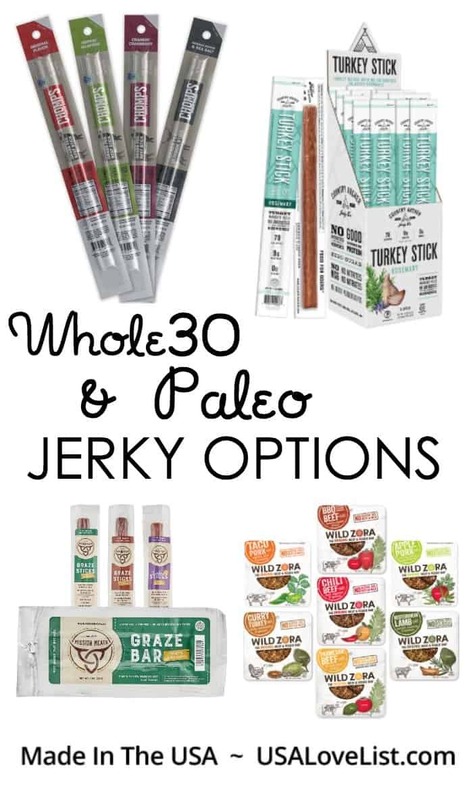 They are all Whole30 compliant, Paleo jerky options. While this list is alphabetical, it must be no coincidence that Ayoba-Yo Droewors are listed first since they are BEYOND amazing and absolutely the best meat sticks I have ever had! They are air-dried beef South African dry sausage made with beef, sea salt, coriander, pepper, cloves, and vinegar. 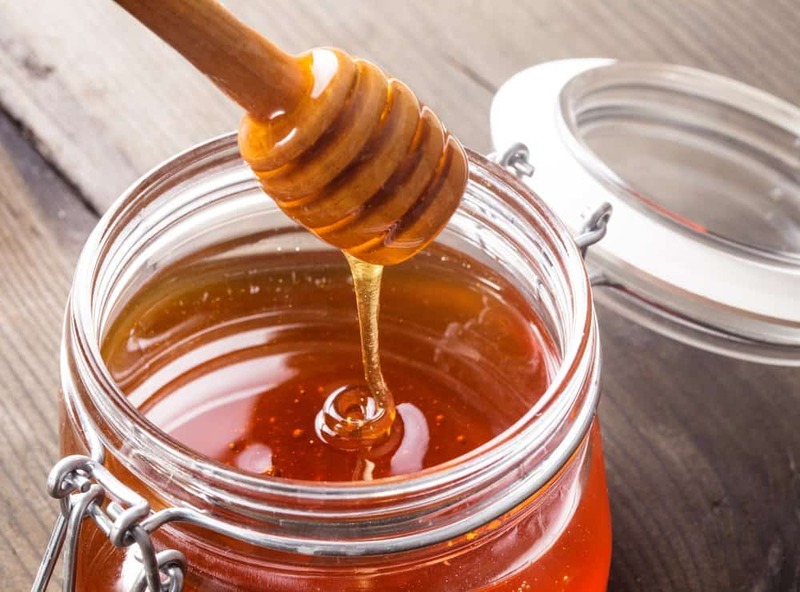 They are carefully mixed stuffed into a natural casing and hung to dry for over five days, making for a crisp, snap when at every bite. You are going to absolutely love these. If you're in the DC metro area, find this Whole30 friendly jerky at your local Whole Foods. Biltong, or dried beef slices, are traditional beef delicacies which originated in South Africa. Brooklyn Biltong makes its seasoned, dried grass-fed biltong meat in Brooklyn. Biltong slices are traditionally cut to include a fine layer of fat which maintains the meat’s tender flavor. The jerky is made from fine cuts of beef which are rubbed with vinegar & spices before being hung to naturally dry which maintains the meat’s natural, tender flavor. The meat is tender, flavorful, and really lean. We’re sure you’ll love it as much as we did. It’s free of additives, colorings, MSG, or nitrates. 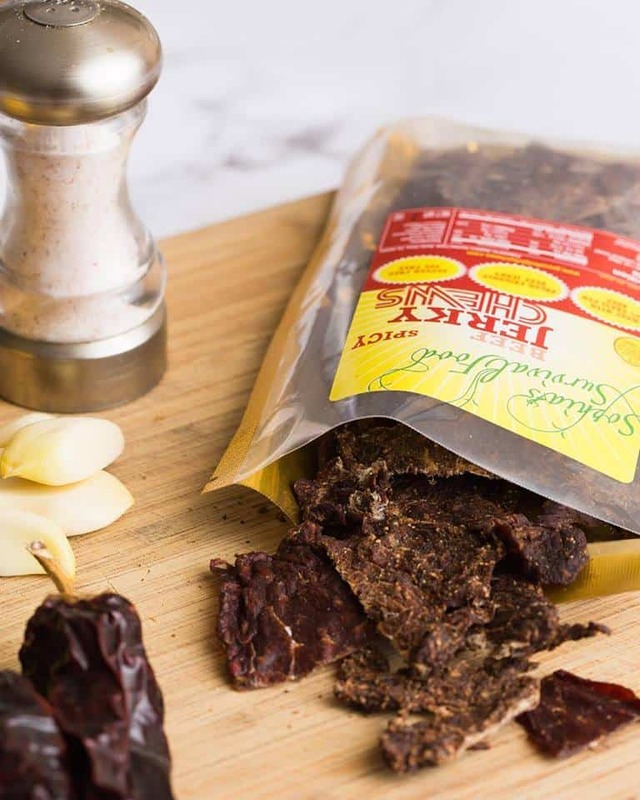 This Biltong is flavorful and easy to chew because is dried with air instead of heat, making it much more tender than traditional jerky. You might be surprised to know that sugar, MSG, and other additives are found in most meat snacks and sticks. Bursting with flavor, soft in texture, with the perfect “snap, Chomps Hoppin’ Jalapeño meat snacks are a must on the Whole30. They are made from 100% Grass-Fed non-GMO beef, jalapeño peppers, water, salt, citric acid, celery juice, black pepper, red pepper, garlic powder, coriander and stuffed in a collagen casing. I’m normally not a fan of jalapeño, but these have the perfect amount of kick without being overly spicy. In fact, they are my favorite flavor. 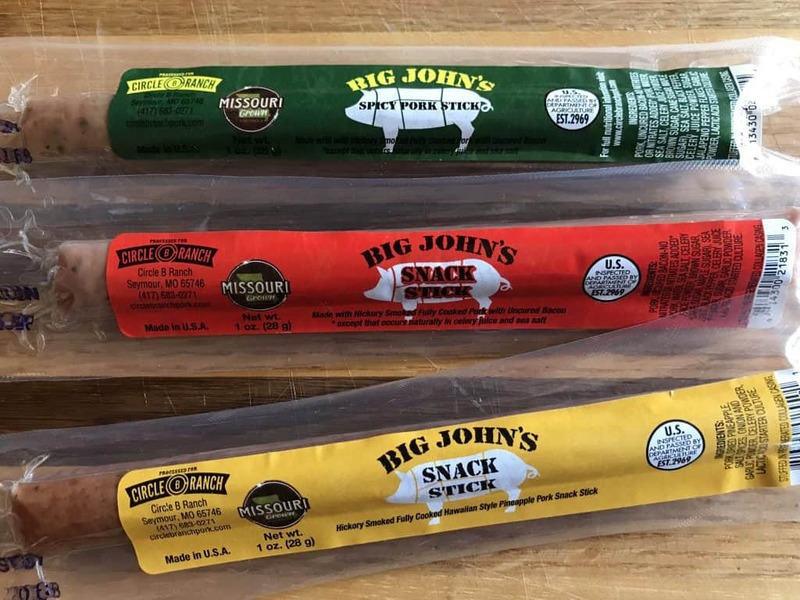 Circle B Ranch brings you its newest product, Big John’s Hawaiian Pork Snack Sticks. They are super flavorful and the most moist and tender jerky sticks I've eaten, which I appreciate. With ingredients only including Pork (from free-roaming Heritage Berkshire/Kurabota hogs), Dried Pineapple, Salt, Spices, Onion and Garlic Powder, Celery Powder, and Lactic Acid Started Culture, these sticks are perfect for the Whole30. They have 5g of protein, 90 calories, 170 mg sodium and no carbs or sugar making them a great source of healthy fats perfect for the Keto diet. There are no add any hormones or use antibiotics and they are 100% American made, from Missouri. NOTE: The Nitrite Free Bacon Snack Stick and Nitrite Free Jalapeño Bacon Snack Stick contain added sugar, not compliant with the Whole30. Circle B Ranch, located in Seymour, Missouri, was started in 2009 by Marina and John Backes. The couple relocated from Branchburg, New Jersey to the lush rolling hills of the Ozark countryside in southwest Missouri. They were looking for the perfect weather for raising Heritage Berkshire/Kurabota hogs. This clean and natural environment allows the hogs to graze freely on the lush pastures and roam the woods foraging for nuts and acorns, while also allowing them to be free from any additional hormones and antibiotics from their feed. Marina and John raise the hogs using sustainable and humane production methods that adhere to the Certified Humane Raised and Handled and Animal Welfare Approved standards of operation. 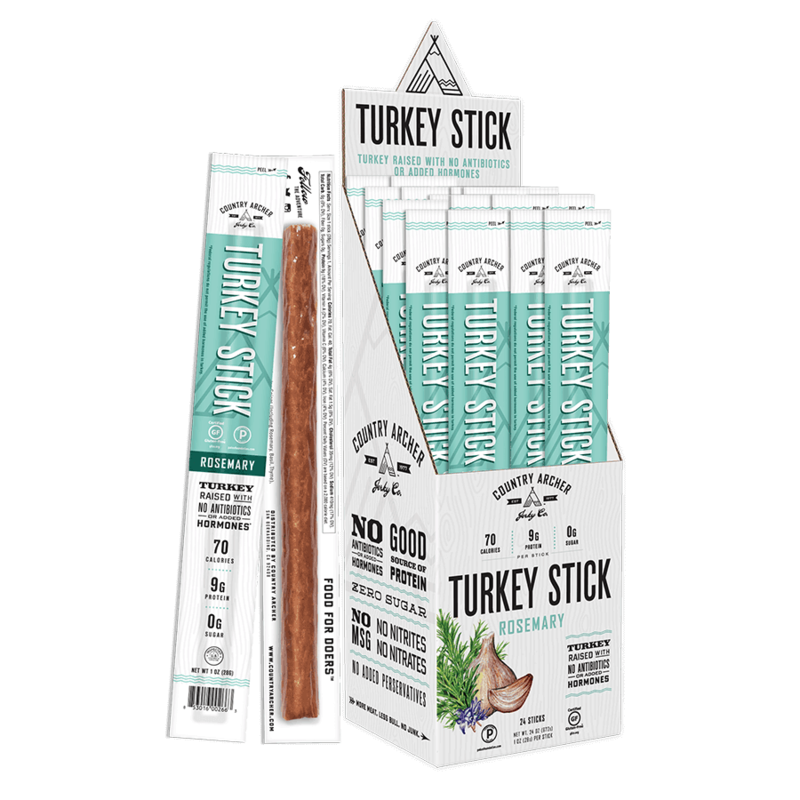 Country Archer Turkey Meat Sticks have great flavor and texture. They are made from antibiotics and hormone free turkey They are gluten-, nitrate-, and sugar-free. Made with turkey, water, turkey stock, sea salt, encapsulated lactic acid, celery juice powder, rosemary, basil, thyme, dehydrated carrot, garlic, and onion powders, and beef collagen casing, these sticks are flavorful and juicy. 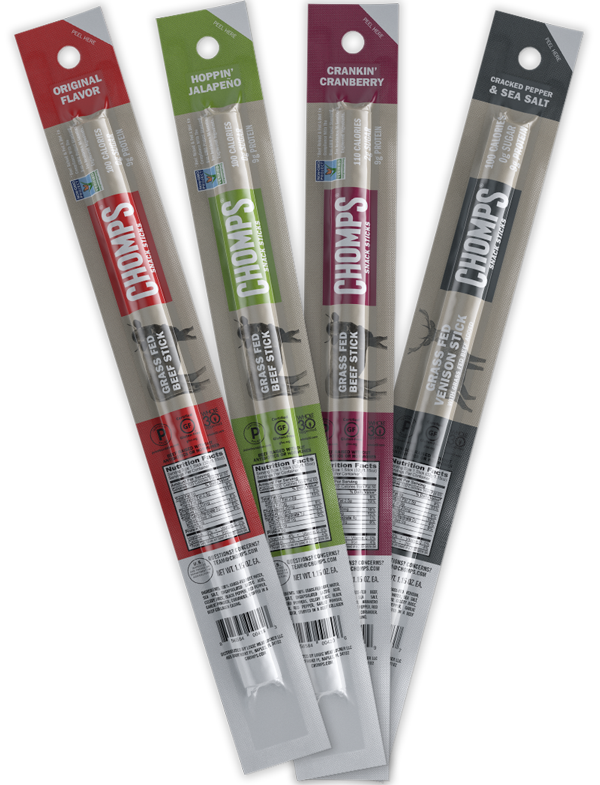 Note: Not all Country Archer jerky is Whole30 compliant, only the beef and turkey sticks. 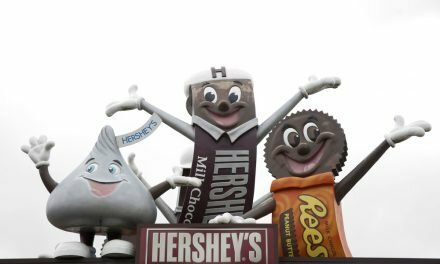 Don't miss our list of the best 17 Unique Jerky Brands, all made in the USA. DNX Fennel Sweet Potato Fennel Bar is packed with organic ingredients flavorful including grass-fed beef, organic Medjool dates, powdered egg whites, organic sweet potato powder, organic extra virgin coconut oil, organic dried goji berries, and organic spices among a few other ingredients. I find this flavor to be the most vibrant and also enjoy the moistness of the bar. 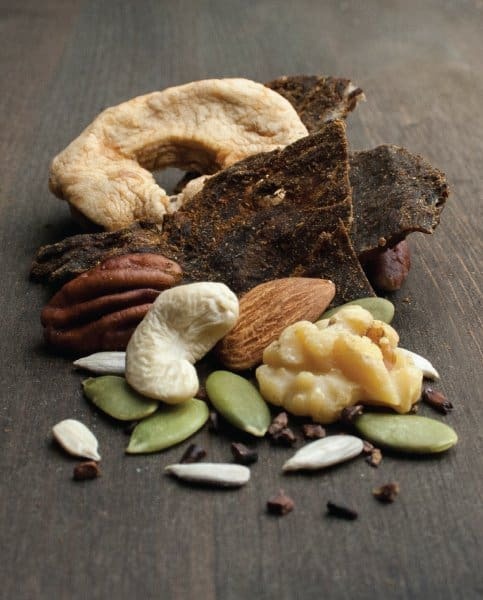 Kooee!‘s Smoked Chipotle with Apple is the perfect marriage of dried fruit, raw nuts and seeds, cacao nibs, and savory jerky, making for an amazing jerky snack option. Kooee! cures its 100% grass-fed meat with coconut aminos, apple cider vinegar, jalapeño pepper, spices, sea salt, and smoked paprika. It’s legit. Mission Meats is on a mission to help people by donating 10% of its proceeds to social-good organizations that have a philosophy of empowering people to help themselves, while also offering us clean, tasty jerky. They offer grass-fed beef and free-range turkey sticks and bars. They have a strong black pepper taste and are a bit less juicy than some of the other meat sticks. If you're a cracked black pepper fan, you'll love these varieties. 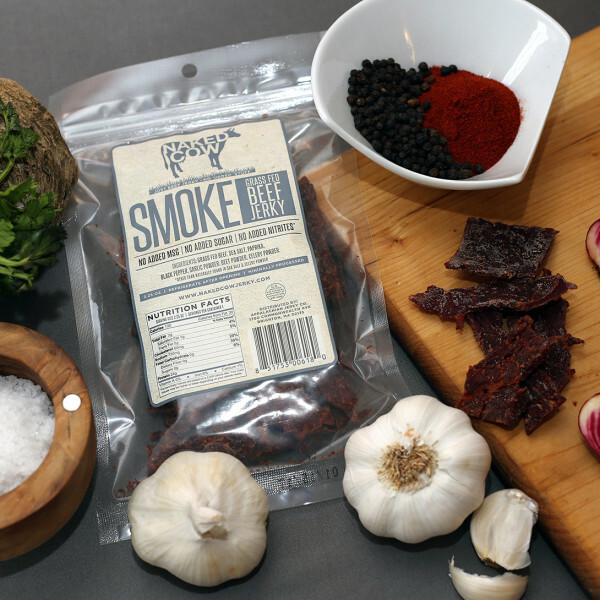 Try the unadulterated pure Grass-Fed Smoke Beef Jerky from Naked Cow. The flavor is unique in that it contains no soy sauce, preservatives, or sugar, like most jerky options. Its just top round beef, chilis, vinegar, salt, garlic, onion pepper, red pepper, and real hickory smoke. All the jerky is made in Ohio using USA-sourced beef. Two friends, Ron Myrick and Doug Labb started their parent company, Appalachian Jerky, outside Brighton, Massachusetts. Show these boys some love! 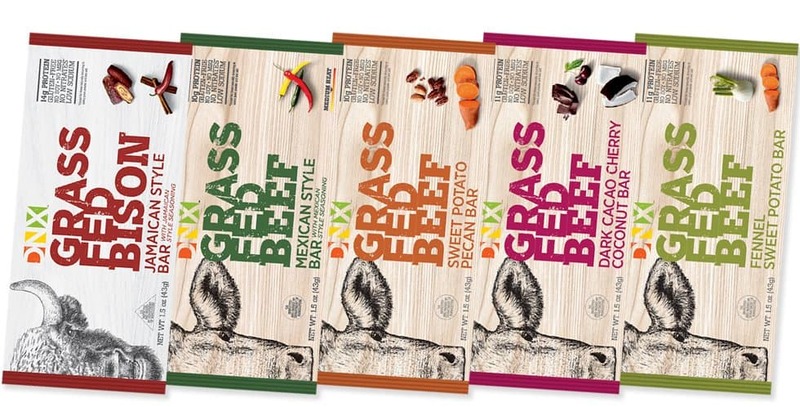 Sophia's Survival Food makes clean ingredient beef jerky from hormone free,100% grass-fed beef. FREE of gluten, soy, dairy, artificial preservatives, and refined sugar. It's the perfect snack for people following Paleo, 21 Day Sugar Detox, Low Carb, and it's Whole 30 Approved. The flavor ingredients are simple for all three flavors, Original (Redmond unrefined sea salt and vinegar), Mild (Redmond unrefined sea salt, granulated garlic, black pepper, and organic lemon juice) and Spicy (Redmond unrefined sea salt, granulated garlic, black pepper, cayenne pepper, and organic lemon juice). The original flavor is my personal favorite because the vinegar makes the beef more tender than the other varieties. If you prefer heat, we recommend the Spicy flavor. 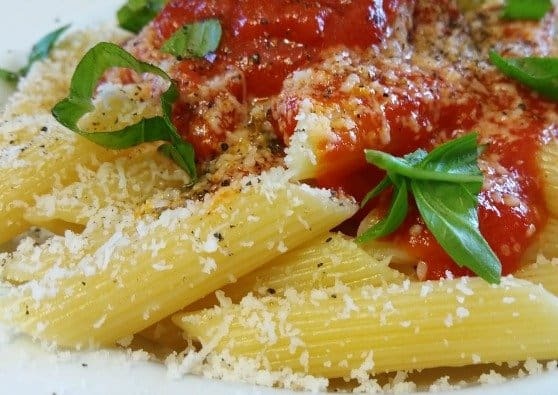 Sophia's Survival Food is a women-owned and operated business by Sophia herself! 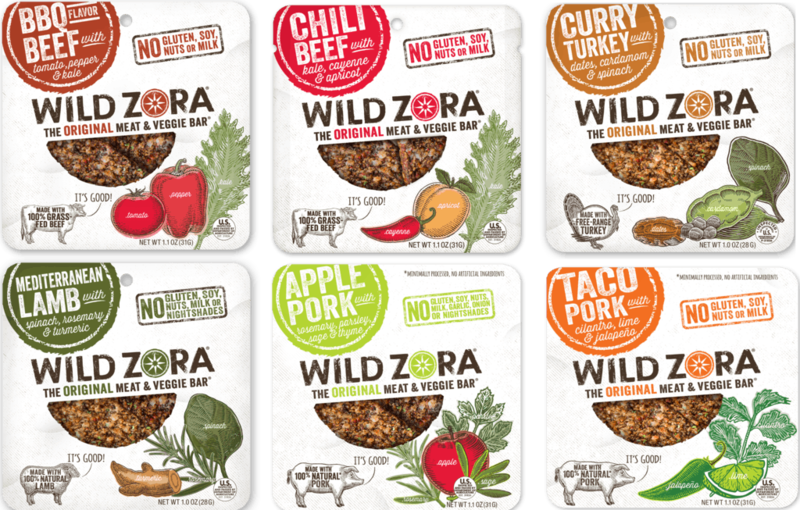 Wild Zora meat & veggie bars are incredibly flavorful, moist, and tasty. It’s a jerky we love. Zora herself makes paleo and Whole30 approved jerky. It’s grain-, gluten-, soy-, nut-, and dairy-free. 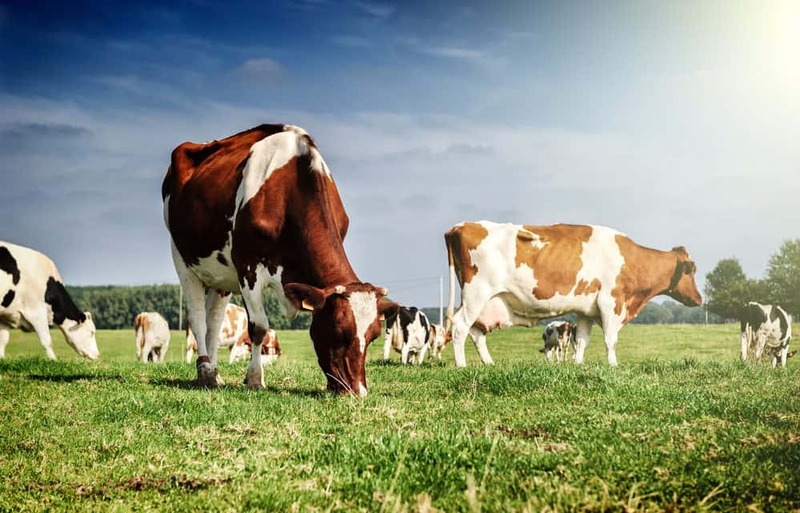 It’s made with grass-fed beef that is free of antibiotics or hormones. The full ingredients, including, grass-fed beef, organic fruits, and vegetables (red bell pepper, apricots, dates, kale, garlic, and onion), spices, cayenne pepper, sea salt, and celery powder. Wild Zora jerky is made in Colorado. 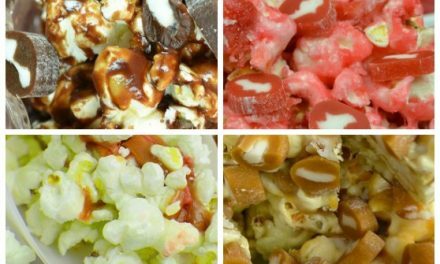 Caramel Popcorn Recipe: We Have One for Every Craving!